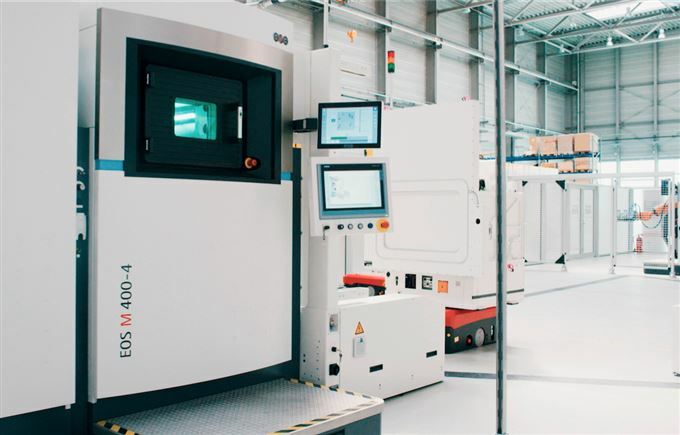 A year after Premium AEROTEC, Daimler, and EOS jointly initiated the NextGenAM project - a future focused 3D printing system for series production - the first pilot plant has been put into operation at Premium AEROTEC in Varel, northern Germany. The project is aimed at developing a complete production cell capable of manufacturing aluminium components for the automotive and aerospace industries. The purpose-built pilot facility currently consists of various machines for additive manufacturing, post-processing, and quality assurance. The innovative factor of the production chain is that the individual steps and the interaction of all additive and conventional process steps, are fully automated and integrated. Manual steps have been eliminated. As a result, complex, lightweight yet robust components can be manufactured and the companies insist, the high level of automation forms the basis for profitable production going forward. At the centreof the pilot production chain is the EOS M 400-4 four-laser system for industrial metal material 3D printing. The system is used in combination with the peripheral solutions of the EOS Shared-Modules concept. The EOS M 400-4 in Varel is therefore equipped with a powder station and connected to a stand-alone setup and unpacking station. As a result, filling and emptying the system with the aluminium material, setting up the system to prepare a new build job, and unpacking the built components from the powder bed can be carried out independently of and parallel to the actual AM build process. This results in significantly increased productivity. The additively manufactured components are transported between the individual stations fully automated and under protective gas in a container on an automated guided vehicle. The downstream post-processing has also been extensively automated: A robot takes the build platform with the parts from the setup station and places it in a furnace for subsequent heat treatment. The same robot then removes the platform again and takes it to a three-dimensional optical measurement system for quality assurance purposes. Finally, the build platform is conveyed to a saw, which separates the parts from the platform, making the components ready for further use. “3D printing is well on the way to establishing itself in the automotive sector as an additional manufacturing method with great versatility. With this collaborative pre-development project, we are taking a significant step towards achieving cost-effectiveness in metal 3D printing throughout the process chain. The project lays the cornerstone for the future realisation of larger quantities in the automotive series production process – with the same reliability, functionality, longevity, and economy as for components from conventional production, ” concludes Jasmin Eichler, Daimler AG, Head of Research Future Technologies.